133 total shares. Be the next! Save Kelly to your Collection. Register Now! Kelly Moore is a Self Taught Artist who has no formal training or education in art. 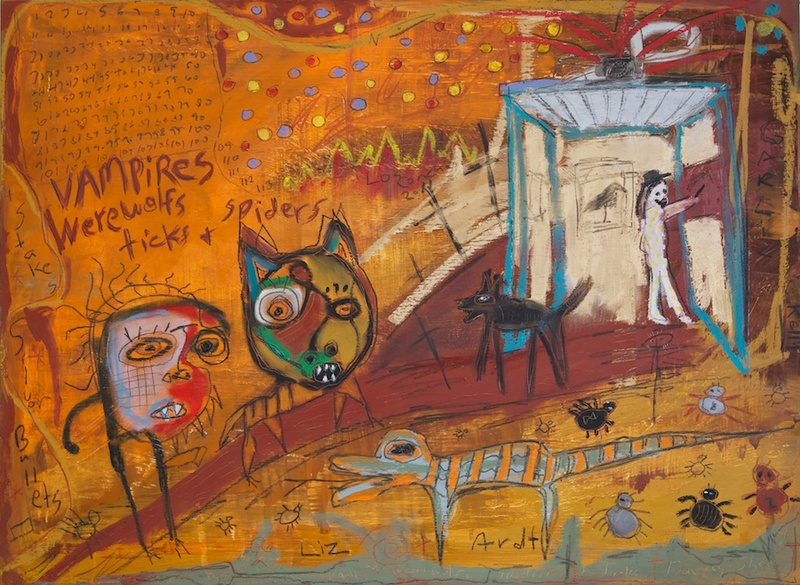 His Original, Expressive work has been referred to as Outsider Art, Art Brut, Raw Art and Visionary Art. 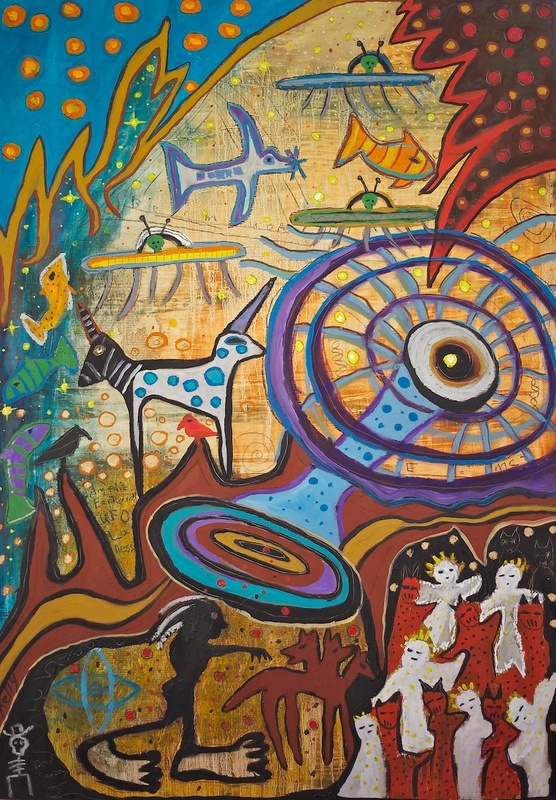 His intuitive style and technique reflects a raw, primitive quality that is frequently juxtaposed with a startling innocence. Knowing Kelly is as enjoyable for me as having his paintings bless your walls. Purchasing original art from such a great personality truly is the experience that brings us to Santa Fe again and again. Kelly's art and his writings are clever, deep, one-of-a-kind, entertaining and thought provoking. He is truly a gift to Earth. Nine of his pieces live in our home, all invoking warm, happy feelings when viewed daily. Not to be missed- Kelly Moore at Tesuque Flea Market near Santa Fe, NM. We couldn't just pass by your wild & crazy booth at Tesuque last fall. What a trip. Love your intensity and joie de vivre. We'll stop by next time in Santa Fe. Best Wishes. We have finally purchased our first original Kelly Moore it has a special meaning for us and we love. We loved his work and sytle from the first time we stepped into the shed. We met Kelly 19 years ago at the Tesuque Flea. I found his art to be everything that I'm not...brave, shocking, colorful, irreverent, and fun! Love the dark birds. kelly 's work is great, i bought a 3 small pieces from him when I visited santa fe and was trilled when I got them home and hung them they are terrific to walk in each day and look at them, I never tire of them and they bring a smile to my home. While on a visit from Wisconsin to Santa Fe, I went to Tesuque to check out "the flea" one day. I meandered through a few aisles of flea market "finds", when suddenly I came upon Kelly's shed. I was unexpectedly STUNNED to see the treasure trove of his art. I had never seen anything like it before. And, YES!! I have been following his work ever since. Two of his pieces hang in my ceramic studio delivering atruly exciting visual burst of inspiration, If you find Kelly's multi-layered, art as exceedingly expressive as I do, choose something that speaks to you and buy it - it will continue to delight and draw you in for years to come.